Arriving at Burning Man can be thought of as heading down a funnel with a lot of other traffic. The interstate leads to the two-lane roads, which themselves lead to the miles-long slow journey through the entrance to the playa once you depart those paved roads. Unlike most large events, Burning Man is not held anywhere convenient to anything. It's in the middle of nowhere. 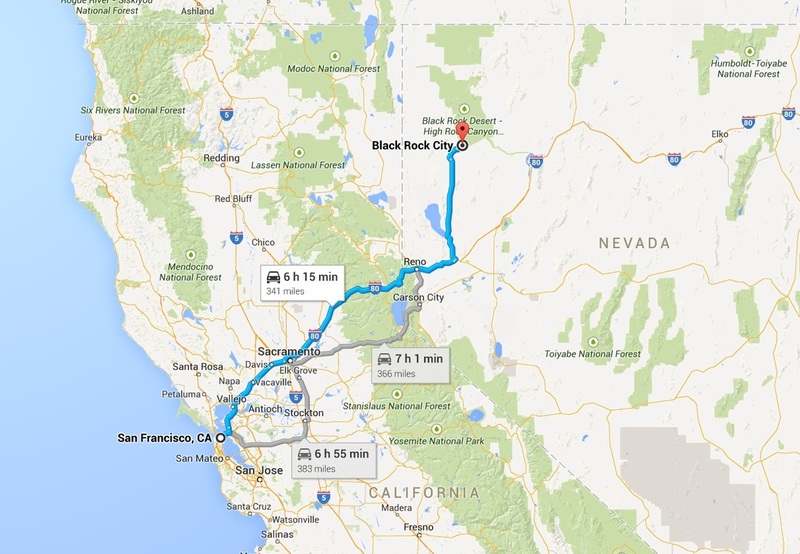 Most people will coming into the playa will come from the south, and will come via I-80 (interstate highway 80). Here's an example trip from San Francisco, with three route options and times, if there's no traffic (haha). Where the road heads due north from I-80 is where things can get dicey. That two-lane road (state highway 447) that goes north from I-80 to the east of Reno is a two-lane road and has limited throughput. There is literally nothing Burning Man can do about this. There are only so many vehicles that can be pumped down a hundred mile two-lane road leading to the playa. Traffic can get really bad on that road during peak arrival hours. Roughly, from mid-day Sunday to Tuesday night are peak hours. It might take you 2 hours from the turn-off. You might find that traffic is completely backed up halfway in and it takes you six hours to get there from I-80. Once you get off I-80, drive strictly the speed limit. Do not go even 1 mile hour over. Not kidding. The local, county, and state troopers are just waiting to nail you, fine you, and possibly use it as an excuse to search your vehicle, potentially with K-9 units. Do...not...speed. Unless it's clearly meant to be used as a pull-off, don't pull off the road. In many places, it's very soft sand, and you'll get stuck. Please be careful. It's not worth aggressively passing on a two-lane road to get to the playa and wait in line 10 minutes early. It might seem callous, but if a rabbit runs out in front of your car, just hit it. Do not slam on the brakes or swerve, both for your benefit and the benefit of the people driving behind you. This isn't an uncommon event. The road is fairly narrow, and there's likely to be a lot of traffic on the road when most people are arriving. You don't want a giant truck that can't brake quickly ramming you from behind and you don't want to swerve into the oncoming lane. Once you drive the ~2 hours (without traffic) from I-80, you'll arrive in the little town of Gerlach, which is your last chance to get gas and supplies. If you're low on gas, you absolutely have to fill up here. If you don't, you risk running out of gas while getting stuck in unexpected exodus traffic while leaving the playa at the end of the weak. There will be lots of little stands selling you food, lights, clothing, costumes, even bikes. Feel free to stop and get whatever last-minute things you need. Please behave in Gerlach. We're the guests of the local people, and while some of them love Burning Man, some of them have serious reservations about the way their town is invaded every year. Let's leave them with a good impression of us! 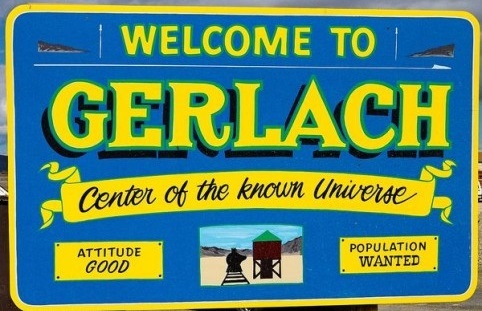 After Gerlach, you'll drive a few miles and arrive at the right-hand turn-off into the desert. Joy! Life's about to get awesome! Don't speed. Obey the posted speed guidelines. They're both for legal reasons and to keep the dust down. This is the fastest way to get pulled over and searched. If you have to use the bathroom and absolutely can't wait, look for porta-potties along the road. Do not lose your vehicle. It can be very disorienting, and if you tell your friend driving that you'll just 'catch up' you may regret it. Do listen to BMIR - Burning Man Information Radio. It's the official radio station of BM. 94.5 FM. It's fun to listen to as you're driving in. Because of the potentially long wait, make sure you have water with you in the car. Even if the rest of your water for the week is going up with someone else, have enough water to survive a day out there if you need to. Do not start partying while you're in line. Law enforcement is present here and drinking and driving laws are in effect. If you're traveling with a rear-mounted bike rack, make sure that your license plate isn't obscured by your bikes. If it is, take it off your car and zip-tie it to the rearmost bike, and, if there's any chance at all that you'll arrive on the playa when it's dark, mount a reliable and bright flashlight or other light on top of it. The reason for all this hassle is because having an 'obscured' license plate has been used as an excuse by law enforcement to pull people in the line over and search their vehicles. Once you get to the gate, you'll be asked for your ticket and car pass, and your vehicle will be searched. Don't panic - it's being searched by Burning Man volunteers and what they're looking for is people trying to get smuggled in. You might laugh, but this isn't uncommon. Burning Man sells out every year now, and people are desperate to get in. They'll try putting themselves in the middle of rolled-up carpets, old-school big-screen tvs, under beds in RVs, and so on. There's also the traditional option to go do a playa angel (think snow angel, but in the dust) if you're a birgin (first-time Burner). No pressure to cover yourself with dust, but it can be a fun way to start the week your first time through if you're so inclined. A birgin friend crossing into Black Rock City at the greeter's station in 2013. Release your fears! And now you're into Black Rock City! Do not go more than 5 mph in BRC. Respect the rules, because law enforcement is actually out there enforcing that speed limit, as well as drinking & driving rules. Drive, slowly, to your camp, which I trust you figured out how to get to before you arrived. Avoid driving on the Esplanade or open playa to get to your camp unless there's no other choice. Be Careful! There are lots of pedestrians, people on bicycles, and people on art cars. Some of them are perhaps not as sober as they might be, so just be extra-careful when driving to your camp. What Time Should I Arrive On The Playa? If you can arrive Early Entry (before the gates open to the general public), do so, but you need Early Entry passes in order to do that (the link has info about early entry passes). Burning Man is best (imo) experienced that way anyway. It's nice to arrive before the crowd and then watch the city build and come alive. For the purposes of this discussion though, it also is the most reliable way of having a minimal entry line, other than arriving very late in the week (see below). However, please keep in mind that Early Entry passes are intended for people coming to help set up Theme Camps or the city itself, and people will actually be working hard right up until Sunday morning or later. If you aren't arriving Early Entry but want the full week, then time it so that you show up as the gates open on Sunday. This year, I (from San Francisco) stayed with other friends heading up in Reno on Saturday night so we could leave early Sunday morning and get to the playa around 10 am when the gate opened. I got there at 11, and was at my camp by 12. Painless. If you arrive from about Wednesday onwards, you're not going to have any real problems with entry lines. Consider how much time you're going to need to set up camp, and make sure you arrive with that much daylight left. Setting up in the dark is completely possible, of course (you have headlamps, right?) but it isn't ideal.